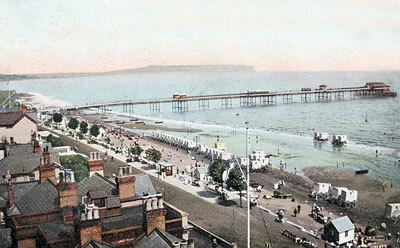 Shanklin pier was opened in 1890, 1200 ft in length with a broad pier head. During WWI cruises ceased, in 1915 the landing stage was damaged and was not replaced until the early 1930's when steamers could again call at the pier. The pavilion was rebuilt on the pier in the late 1920's and many famous acts appeared there over the years. During WWII a section was taken out of the pier so that it wouldn't assist any invasion. The pier was heavily damaged by enemy bombing. The pipe for PLUTO, used to supply fuel to the Allied forces in Normandy, was laid along the pier. The pier was severely damaged during a storm in October 1987, with a large section in the middle being washed away. Although there were plans to reconstruct the pier, these never came to anything, probably due to lack of funds, and the remains of the pier were demolished in 1993.